Common sense prevailed at Cherwell District Council today when the Bicester Gateway development was refused by the Planning Committee on the grounds of size, scale and traffic congestion. The Committee, spent almost an hour hearing information about the development from the planning officer and points from the committee members. BicesterTAG and a representative of Bicester Vision, spoke against the proposal. Speaking for the proposal was a representative of the developer and a member of Kingsmere Residents Association. 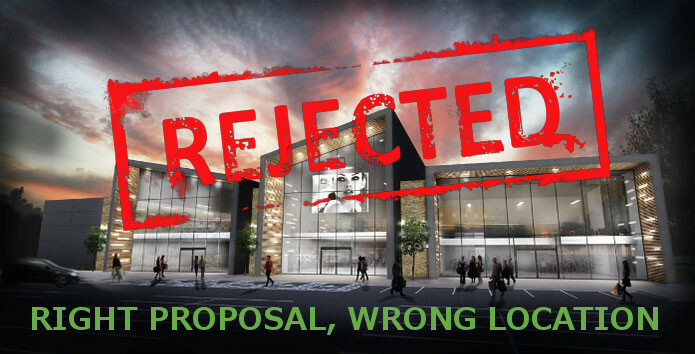 Several Councillors spoke out against the proposals including robust rejections of the scheme from Bicester Councillors Richard Mould, Lawrie Stratford and Rose Stratford. Their reasons included; impact on Town Centre, insufficient car parking, A41 junction congestion, overflow parking into Kingsmere, goes against Cherwell's Local Plan, opposition from local businesses, no firm commitment M&S/Next would actually sign tenancy agreements, peak traffic congestion, loss of higher salaried employment, inappropriate site, and proximity to school to name but a few. It is important to note that the Councillors were not against such retailers coming to Bicester but just the location. All said they would like to see the stores come to Bicester but not in that precise location (see below for the Council's full reasons). Those who spoke for approving the development were Councillors Lynn Pratt and David Hughes. Mrs Pratt's reasons included Bicester being the fastest growing town and Bicester residents expecting infrastructure to keep pace with expansion. Mr Hughes noted that employees would have to walk to work to save parking spaces, he had received many letters from residents in favour and driving to Oxford instead of to a store in Bicester was less 'eco-friendly'. WHY ARE THE COUNCIL AGAINST THE PROPOSAL? The show of hands was 9 for refusing the development, 3 for approval and 2 abstentions (tbc). WHY IS BICESTERTAG AGAINST the scheme? Our submission was prepared by Bicester resident Mr Gerry Harvey, a Fellow of Institute of Highway Engineers, a past member of the Chartered Institute of Highways and Transportation and someone with over 30 years experience in planning and traffic assessment. It is fair to say that Gerry knows his stuff! Two other independently commissioned traffic assessments came to almost identical conclusions. Oddly enough they were commissioned by Value Retail (Bicester Village) who ironically are worried about traffic congestion to their own site. Shocking! Many local businesses including Sainsburys, Bicester Office Park and Bicester Sports Association also objected. To help illustrate where all this CURRENTLY approved development is going to be located we have produced this map showing the approximate sites of each of the plans including the site of the proposed Bicester Gateway and the Kingsmere development. 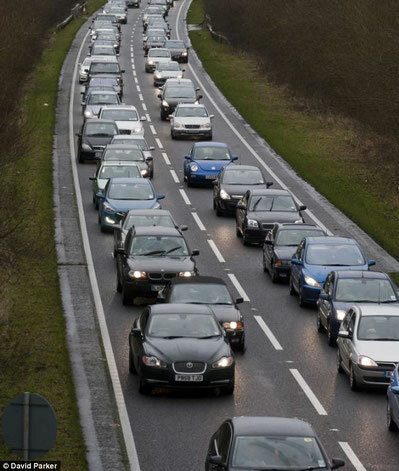 We all remember how bad the A41 can be when Bicester Village is busy. This image (© David Parker/Daily Mail) shows how bad the road was on Black Friday last year. If another large retail development such as Bicester Gateway, with up to 9,000 vehicle movements predicted per day, would this scene occur every weekend? Reaching the development by car (or the new Tesco store) would be nigh on impossible. Anyone wishing to leave Bicester would have to seek alternate routes via M40 J10 or via villages such as Chesterton or Ambrosden. Bicester still needs more retail facilities that are appropriate to the local community, unlike Bicester Village. The brands of Marks and Spencer and Next would be very welcome and popular decisions throughout town as our survey back in March clearly demonstrated. 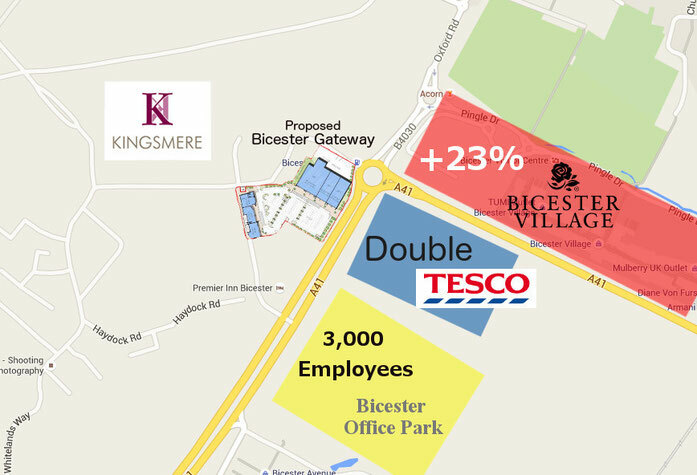 The 'Bicester Gateway' proposal was extremely popular amongst Kingsmere residents. Those who have lived in Bicester slightly longer and see the chaos and congestion Bicester Village cause less so. However we are all united in wanting more and better services. Other sites are available, there is an opportunity to build near to the airfield or NWBicester on sites already earmarked for future warehousing; the now vacant Sheep Street Tesco store could be re-built and integrated into the Pioneer Square format more deeply with expanded rooftop parking. Another option already proposed involves redeveloping Claremont Car Park in a similar style to Pioneer Square. Thank you so much for a clear and comprehensive account of what is happening in regards to the planning in bicester. I am pleased that planning has been turned down for the retail park and at last it seems that common sense has prevailed. I too would love these retail shops in bicester and am pleased to hear that other sites are being considered. There is so much ranting going on whenever bicester village is mentioned that sometimes it detracts from the real issue. I would hate to see bicester go the way that Dudley has gone since the merry hill development was built in the midlands. I was born in Dudley, and although I haven't lived there for a very long time, I was deeply saddened to watch from afar it demise. There are still several shop premises vacant in the centre of town in the development around Sainsbury's. Why not fill the existing vacant ones first? I seem to remember rumours of stores such as Next etc occupying those empty lots some time ago. M&S and Next site one of the reasons for not going into the town as lack of units big enough for their stores. The cynics amongst us would note that the town centre development, sponsored by Sainsbury's has not provided any provision for any sizeable units read 'competition'... funny that! BicesterTAG is 100% volunteer organisation. We are 100% politically independent. We aim to represent the people of Bicester, Oxfordshire and the surrounding villages in all traffic related matters.